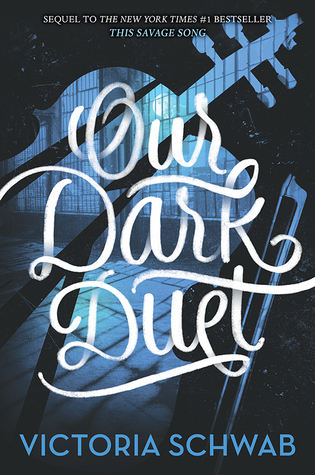 I went into reading Our Dark Duet without many expectations and even that was too much. The Monsters of Verity duology is really not something for me. I give Our Dark Duet by Victoria Schwab two our of five hearts, because I really didn’t care for it. It wasn’t very well written and very slow. Victoria failed to salvage whatever she had left for me in This Savage Song. The characters were the same as before and I didn’t care for them. They hadn’t learned anything for the events in the previous book or the time in between the two novels. I actually didn’t even notice there had between the books except for that the references to things that weren’t described in either of the books. August was an empty shell and it made me wonder where he had gone. This wasn’t explained, except that it allowed him to be the monster he was born to be. I didn’t care for any of the new characters that were introduced and so in the character department the novel fell flat. Maybe this is one of those cases where the deadline ruined the book. I have no idea. But I not very amused by authors pushing out several books a year because it doesn’t help their work. Story was sloppy and lacking in a lot of departments. What I do love about it were the descriptions of August’s music, I could feel those moments trying to move me, but then something else happened and I lost it. This entry was posted in Book Review and tagged Book Review, Drama, Fantasy, Mystery, Romance, V.E. Schwab. Bookmark the permalink.